It ́s one of the most interesting and popular tourist destinations in Costa Rica. We offer 3 different packages. 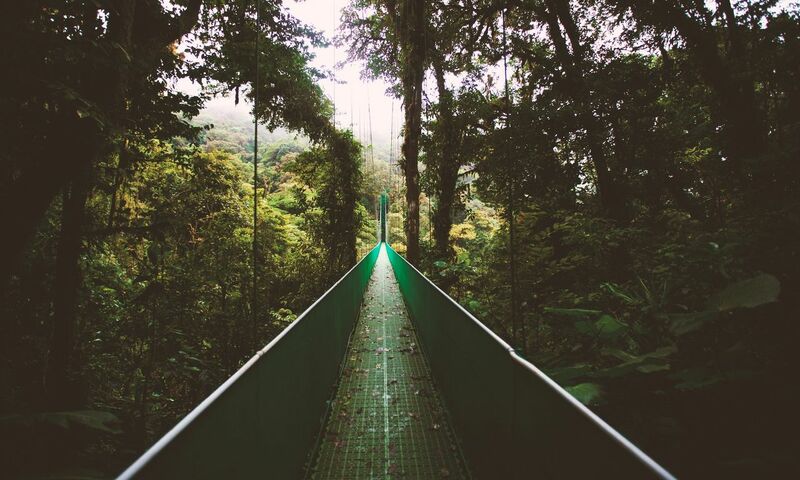 Enjoy a 1 3/4 hour treetop walkway that includes various hanging bridges that cross through the Cloud Forest. Monte Verde is home to the original Eco Tours, Canopy Tours and Hanging Bridges. Imagine yourself in a beautiful garden with hundreds of hummingbirds flying cheerfully around you! Then enter one of the largest butterfly gardens in the Americas. Finally visit the amazing collection of reptiles and frogs, including beautiful lizards and snakes. ZIP LINE CANOPY TOUR! If you are looking for extreme Adventure, you will be flying through 15 cables and 18 platforms with an optional and unique Tarzan Swing at the end of the adventure. This is among the longest in Costa Rica. This is one of the most fertile Coffee growing areas and you will get the chance to learn about the growing and harvesting process and how authentic coffee is made with methods used by generations on a working coffee farm. Recommendations: Camera, binoculars, ponchos, change of clothes, hiking shoes/boots. Includes: Transportation, bilingual guide, lunch and drinks. Pick up: 6:00am at the door of your villa.